Cardiac resynchronisation therapy (CRT) is a very effective treatment for selected patients with severe and mild heart failure (HF), impaired left ventricular (LV) function and a wide QRS complex. Findings from randomised clinical trials (RCTs) and numerous observational studies have provided insights as to which patients benefit the most. Technological advances, such as the quadripolar lead and LV endocardial systems have made CRT more effective and more widely available. While indications for CRT are unlikely to change in the foreseeable future, this review discusses how developments over the next 10 years may see progress with leadless CRT systems, perhaps in combination with a subcutaneous device. Cardiac resynchronisation therapy (CRT) is a standard treatment for patients with heart failure (HF), impaired left ventricular (LV) function and a wide QRS complex. The therapy emerged following the recognition that disturbances in inter- and intra-ventricular conduction contribute to LV dysfunction. Since its first clinical use,1,2 robust evidence from randomised-controlled trials (RCTs) has supported its use in patients with severe and mild HF. In combination with defibrillation (CRT-D), CRT reduces mortality from pump failure and sudden, arrhythmic cardiac death (SCD). Since the last RCTs on CRT,3 the field has undergone a period of ‘soul-searching’, dominated by subanalyses of RCTs and observational studies geared towards risk stratification and therapy optimisation. A similar scrutiny has been adopted in the field of implantable cardioverter-defibrillator (ICD) therapy. Although indications for CRT have not changed substantially in the past 10 years, we are now clearer as to which patients benefit the most. Advances in device hardware and lead technology, as well as a more systematic approach to medical therapy have contributed to improving patient outcomes. In the DANISH (Danish Study to Assess the Efficacy of ICDs in Patients with Non-ischemic Systolic Heart Failure on Mortality) study, 1,116 patients with NICM were randomised to usual clinical care (control group) or ICD, with or without CRT.13 In the treatment and control groups, 58% received CRT. After a median follow-up period of 67.6 months, there was no difference in total mortality, despite a 50% reduction in SCD. This finding has raised doubts as to the benefit of CRT-D over CRT-P in NICM. Importantly, however, DANISH may be underpowered to show a benefit from ICDs in NICM. In this respect, the NICE network meta-analysis undertaken prior to DANISH required 1,457 patients to show a survival benefit from ICDs in NICM,6 and even higher numbers were used in recent meta-analyses that include DANISH.14 On this basis, DANISH undoubtedly changes our perspective as to the use of CRT-D versus CRT-P in NICM, but it is not the ultimate trial. On the other hand, DANISH confirms the survival advantage of CRT-D in younger patients (<59 years). The incidence of SCD in the landmark trials of CRT from the early 2000s was high.23,24 This, however, may be changing. In a recent meta-analysis comprising 40,195 patients with HF enrolled in 12 clinical trials from 1995 to 2014, Shen et al. have shown a 44% decline in the rate of SCD across trials.25 Although these authors invoked the possible effects of angiotensin receptor neprolysin inhibitors on SCD, the trials predated their use. Moreover, the apparent decline in SCD in HF could reflect selection trends for HF trials and not necessarily the incidence of SCD in potential CRT recipients, nor indeed, in the general population. Nevertheless, it seems reasonable to consider that SCD in HF may now be less frequent than in the early 2000s. Atrial fibrillation (AF) occurs in up to 25% of patients with HF in New York Heart Association (NYHA) class II /III, and in up to 50% of patients in NYHA class IV.26 In AF, CRT cannot correct atrioventricular dyssynchony, but only inter- and intra-ventricular dyssynchrony. In the largest observational study to date, Gasparini et al.27 explored the outcome of CRT in patients with permanent AF, in combination with atrioventricular junction ablation or rate-slowing drugs. Over a median follow-up of 37 months, CRT with ablation had comparable risks of total and cardiac mortality to patients in sinus rhythm, while AF treated with rate-slowing drugs had a worse outcome. Importantly, CRT recipients with AF and atrioventricular junction ablation have a lower risk of appropriate and inappropriate ICD shocks, as well as fewer all-cause and HF hospitalisations.28 Randomised trials of CRT in patients with AF have not been undertaken. Subanalyses of both REVERSE (Resynchronization Reverses Remodeling in Systolic Left Ventricular Dysfunction)34 and MADIT-CRT (Multicenter Automatic Defibrillator Implantation Trial with Cardiac Resynchronization Therapy)35 suggested a reduced benefit in patients with non-left bundle branch block (LBBB) QRS morphology. However, LBBB morphology is not an independent predictor of total mortality according to a network meta-analysis of CRT trials.36 On balance, it would appear that QRS morphology is only relevant at a QRS <150 ms, as recommended in recent NICE guidelines. In this context, however, the clinician implanting an ICD without an LV lead, as recommended by NICE for some patient groups, invites a future upgrade to a CRT-D system, which carries a high risk of infections and other complications.37 For the clinician and the patient, one should minimise the number of interventions. Apical or non-apical LV lead position? It is now widely accepted that an apical LV position in CRT is undesirable. This notion emerged from subanalyses of MADIT-CRT38 and REVERSE,39 which are essentially observational studies, apical LV lead positions were less favourable than basal or mid-LV lead positions. Previous evidence, however, shows that an apical LV lead position is more favourable than non-apical positions.40-41 In humans, we observed a better haemodynamic response from LV apical pacing compared with basal LV pacing in patients with ICM and a LBBB.42 In a study of 1,189 patients undergoing CRT, we have shown that an apical LV lead position was associated with a lower cardiac mortality than a non-apical position, death from pump failure was lower with apical than with non-apical positions, as was the risk of SCD (66%) (figure 4).43 Despite recommendations from consensus statements, which are all based on observational data, it is still questionable whether an apical LV lead position in CRT is undesirable. Early CRT studies showed that atrioventricular delays govern LV function.44 Echocardiography gained credence in identifying which atrioventricular delay yields the optimum LV filling. Echocardiographic optimisation techniques, however, are laborious and impractical in routine clinical practice. Despite the fact that it was never tested or validated as an optimisation tool, echocardiographic optimisation was once regarded as the gold-standard. In RCTs, however, it appeared to be as effective as nominal device settings in ‘all-comers’.45 Nowadays, few centres undertake routine echocardiographic optimisation, choosing, perhaps, to do it only in ‘non-responders’. Targeting LV pacing sites: scar or latest activation? Dyssychrony assessment using echocardiography was abandoned following the findings of the PROSPECT (Predictors of Response to Cardiac Resynchronization Therapy) study,49 in which no echocardiographic measure of dyssynchrony could reliably predict the response to CRT. The most negative aspect of dyssynchrony assessment in patient selection was provided by the Echo-CRT study, in which patients with a QRS <120 ms and with evidence of mechanical dyssynchrony derived no benefit from CRT.32 Accordingly, echocardiographic measures of dyssynchrony have been abandoned by all clinical guidelines. Quadripolar LV leads were instantly welcomed by implanters, even before clinical evidence emerged in their favour. The possibility to use multiple pacing vectors to avoid phrenic nerve stimulation was a ‘game-changer’. Several studies have now shown that quadripolar leads are associated with higher implant success rates and lower rates of re-interventions for LV lead displacement or phrenic nerve stimulation.54,55 Surprisingly, quadripolar leads programmed to single-site LV pacing are also associated with better outcomes in observational studies.55,56 In the MORE-CRT (More Options Available With a Quadripolar LV Lead Provide In-Clinic Solutions to CRT Challenges) trial, in which 1,074 patients undergoing CRT-D were randomised to bipolar or quadripolar leads, freedom from the composite end point of intra-operative and post-operative LV lead-related events at six months was greater with QUAD than with bipolar leads (83.0% vs. 74.4%, p=0.0002). In a study of 847 CRT recipients, we showed that quadripolar leads were associated with a 68% lower total mortality.57 Re-interventions for LV lead displacement or phrenic nerve stimulation (PNS), which were lower with QUAD, predicted total mortality, cardiac mortality and HF hospitalisation. Studies on multiple LV leads might suggest that pacing from separate LV leads (multi-site pacing) may be preferable to pacing from a single lead. Leclercq et al. showed that multi-site pacing leads to a more pronounced LV remodelling response.58 However, implant success was relatively low and procedure times were high. The possibility that multi-point pacing (MPP) might be superior to single-site LV pacing in CRT was explored by Lercher et al., who showed that, compared with atrial-only pacing, MPP was associated with a greater increase in systolic blood pressure than the best single-site configuration.59 Initial results from the MORE-CRT MPP (MOre REsponse on Cardiac Resynchronization Therapy With MultiPoint Pacing) study (NCT02006069) suggest that MPP may not be superior to single-site LV pacing in non-responders to CRT. Currently, MPP should be reserved as an option in non-responders, but certainly not before trying different LV vectors, and never in ‘all-comers’. Endocardial pacing in CRT is conceptually attractive, as the endocardial conduction is faster than epicardial conduction. Various modalities for LV endocardial pacing have emerged, using atrial transeptal and ventricular transeptal approaches. The worrying aspect of these approaches, however, is the risk of thromboembolic stroke and the difficulties that may ensue at extraction. The feasibility of endocardial stimulation for CRT with a leadless ultrasound-based technology has recently been shown,60 and outcome data are awaited. Importantly, however, this system relies on triggering from a pre-existing device, which means that patients will have been implanted with three devices and several leads. Combining such technology in a single device might be the way ahead. The subcutaneous ICD (SICD) is a promising therapy for selected patients with indications for ICD therapy, particularly the young and those at risk of device infection. While RCTs comparing SICD and conventional transvenous ICDs are awaited, the SICD system is gaining popularity. Importantly, however, the current SICD cannot deliver CRT, nor bradycardia pacing. Efforts, however, are being made to combine the SICD with devices that deliver bradycardia pacing and CRT in a transvenous lead-free platform. Intuitively, a ‘modular’ platform that provides choice within a leadless CRT system and a SICD is attractive, but these are yet to emerge. For now, patients with a SICD who later require CRT-D are likely to undergo upgrade to a transvenous CRT-D system. While clinical guidelines are the cornerstone of clinical decision-making, patient characteristics on which to base clinical decisions are limited. In CRT, they are NYHA class, LVEF, QRS duration and QRS morphology. The benefit of CRT-D and CRT-P, however, is also dependent on other factors, such as patient preference, frailty, renal function, comorbidities and life-expectancy in view of non-cardiac conditions, most of which have not been addressed by RCTs. Figure 6 shows a decision-making framework for use in deciding on device type, taking into account factors that have not been satisfactorily addressed in RCTs. 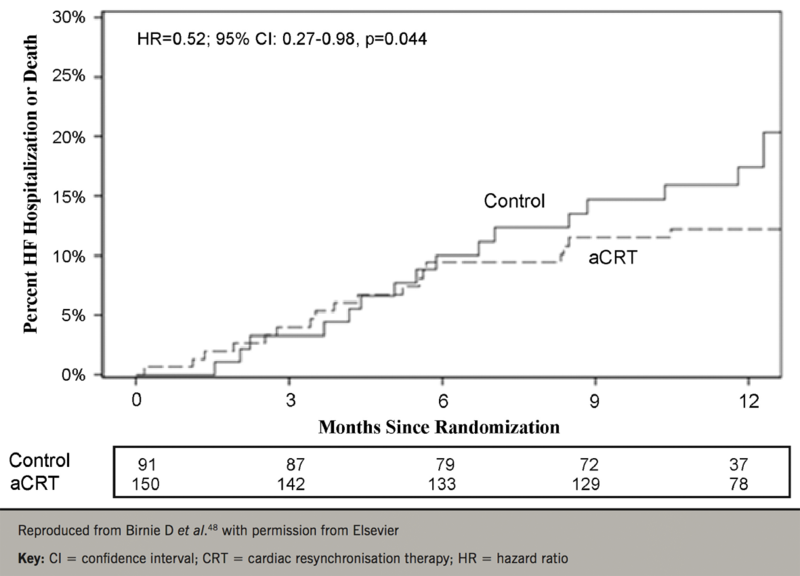 CRT is a very effective treatment for selected patients with severe and mild HF. Scrutiny of the findings of RCTs and numerous observational studies have provided useful insight as to which patients benefit the most. Technological advances, such as the quadripolar lead and LV endocardial systems have made CRT more effective and more widely available. The demonstration that device optimisation algorithms are as effective as echocardiography has also simplified follow-up. While indications for CRT are unlikely to change in the foreseeable future, the next 10 years may see the development of leadless CRT systems, perhaps in combination with a SICD. FL is a consultant and has received research support from Medtronic Inc, Abbott, Boston Scientific and Microport. 1. Bakker P, Meijburg H, de Jonge N et al. Beneficial effects of biventricular pacing in congestive heart failure. Pacing Clin Electrophysiol 1994;17:820.